Produced with careful attention to detail and historical accuracy, this 57:58 minute documentary chronicles the rich, vibrant history of the Jewish community of Vilna (then Poland, now Lithuania) before its destruction in WWII. The film focuses on the pre-war life of this vibrant culture depicting its hopes, dreams and remarkable achievements, a cultural atmosphere producing illustrious figures like: Chaim Soutine, Jacques Lipchitz, Jascha Heifetz, Avram Sutzkever, Chaim Grade, Joseph Buloff, The Vilna Troupe, naming just a few. The community's dedication to culture and education was so strong that, during the Holocaust, its people risked their lives to save precious books and documents marked for destruction by the Nazis. Locked in the ghetto, fully aware of their imminent annihilation, they continued to present concerts, theatre and art exhibitions. "It's important for the world to know how we lived," says one survivor, "not only how we died." This film, narrated by Mandy Patinkin, tells their story. Today, Vilna survives only in memory. Its Jewish community was massacred in the Holocaust. Narrated by acclaimed actor Mandy Patinkin, The World Was Ours is a new one-hour documentary (APT Exchange; March 30, 2008) that explores the vibrant and creative life of the Jewish community of Vilna (now Vilnius, Lithuania) between the two world wars. Drawing upon archival photos and footage, excerpts from diaries and letters, and through interviews with survivors and scholars, The World Was Ours evokes the spirit of this rich literary, scholarly, intellectual, artistic and socially conscious community that helped shape many of the great ideologies of 20th century Jewish life. 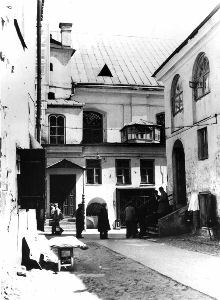 Vilna, with its Jewish community of 60,000, was the center of a network of Yeshivas that was the main training ground for the world’s rabbis. Defiantly using Yiddish when other Jewish communities had started to abandon the language, Vilna was a center of the Russian Jewish Enlightenment. It was the birthplace of a key branch of Zionism and of the Jewish Labor Bund, the most significant Jewish socialist organization of the 20th century. The city produced a lively generation of writers, artisans, engineers, doctors, and political activists. It was also the birthplace of the Jewish Scientific Institute, or YIVO. YIVO rapidly developed into a rallying point for Jewish historians, sociologists, artists and writers who saw in its sophisticated approach to Jewish questions a path for the Jewish people to achieve equal rights in modern culture without abandoning their own distinct character. After the war, YIVO was relocated to New York City, where it functions as an important center for Jewish studies. In 1941, during World War II, German forces seized Vilna and made it the first urban Jewish community the Nazis set out to exterminate. The great scholarly institutions and libraries of Vilna were plundered by the Nazis, for whom extermination of the people was not enough. Vilna Jews risked their lives to save precious books and documents marked for destruction by the Nazis. Locked in the ghetto, fully aware of their imminent annihilation, they continued to present concerts, theatre and art exhibitions. While there has been intense interest in the Holocaust over recent years, there have been few attempts to explore the soul and character of the Jewish world that was destroyed during World War II. Many Americans mistakenly believe that Jewish Eastern Europe was defined by rural poverty and cultural backwardness. In fact, Jewish life in 1930s Eastern Europe was primarily urban, forward-thinking, and intensely creative. The tragedy of the Holocaust extends beyond the unspeakable loss of life, but also to the loss of a modern and energetic Jewish community that was making valuable contributions in the arts, in literature and in many areas of scholarship. Mira Jedwabnik Van Doren, the producer and director of "The World Was Ours," is an artist who has exhibited widely and whose paintings are in numerous private collections. An award-winning pioneer in the art of vitreous enamel on steel, she has worked with leading architects creating murals, doors, elevators, furniture and decorations for ships, banks, hotels, synagogues and churches. In the past decade she has taken on the role of filmmaker. Her most recent project is a documentary called The World Was Ours, narrated by Mandy Patinkin, which had its première on April 30, 2006 at The National Center for Jewish Film at Brandeis University. The film depicts the remarkable Jewish community of Vilna, Poland (now Vilnius, Lithuania) before its destruction in World War II. Ms. Van Doren was born in Vilna in 1929 where she spent her childhood. She left with her parents for the United States on August 22nd, 1939 for a visit to the World's Fair, sailing on the "Stefan Batory", the last ship to leave Poland, six days before the start of the Second World War. Unable to return after the outbreak of hostilities on September 1st, she and her parents became permanent residents of the United States and, eventually, citizens. She grew up in New York City, studied at Queens College, Cranbrook Art Academy, the Arts Students' League and Columbia University. She has a degree in Fine Arts. Her father was David Jedwabnik, a noted physician and prominent leader of the Vilna Jewish community. Her mother, Lydia Baruchson Jedwabnik, was an artist. With this heritage, Ms. Van Doren felt a responsibility not only to remember the world she left behind but also to tell story of its legacy. To accomplish this, she formed a non-profit organization, The Vilna Project, Inc., dedicated to preserving, documenting and disseminating material evoking the richness and diversity of pre-war Vilna. She conducted extensive research toward depicting Jewish life in the city, assembling more than 120 hours of interviews with survivors and scholars and collecting thousands of photographs and other historic material. In 1998, Ms. Van Doren produced the short film (30 minutes), Hidden Treasures, which tells the story of the discovery in Vilnius of a large collection of books and records, kept hidden in a former monastery for 50 years. In 2002, the YIVO Institute awarded her the first Vilna Award for Distinguished Achievement. She was also honored by the Folksbiene Yiddish Theatre for her work on the documentary film. Ms. Van Doren is married to John Van Doren who, for over 30 years, was the Executive Editor of "The Great Ideas Today" and a fellow of the Institute for Philosophical Research. Mr. Van Doren was a professor of American History and English at Brandeis University and Boston University. The Van Dorens have two sons, two daughters-in-law and four grandchildren. Visit the Museum of Family History's main Vilnius page, and see what other material of interest is available for viewing.